I first ran into yukatas at Disney Sea. Being the foreigner that I am, I yelled out, “Look at the cute kimonos!” The Meiji students I was with, however, immediately corrected me, informing me that what we were seeing were not kimonos, but actually yukatas. Sounding very similar to the past tense conjugation of the adjective good (yokatta), I was deeply confused by this word until it was written out for me. Throughout the rest of my stay in Japan, though, I didn’t regularly see women in yukatas, but it wasn’t unusual to see one occasionally. Unlike Tokyo, Kyoto is well known for its geishas, which make the city an alluring destination for people, like myself and Natasha, who wish to dress up and walk around in more traditional clothing. With enormous help from our TA, we made an appointment to get the whole shebang (yukata, shoes, purse, and hair). At first, I was apprehensive that my enthusiasm to experience and be a part of the culture through dressing up would be misconstrued as racist, but I was reassured by my Japanese acquaintances and classmates alike that no one interprets it that way. Reassured, I practically skipped all the way to the yukata store from sheer excitement. The building was modern and unassuming, with the only indication that we were in the right spot being girls dressed in yukatas going in and out of the entry area. We had already been warned that the process would take about an hour, but it became real when we walked in, took our shoes off, and then were offered a bag to carry our shoes around in; I immediately thought, oh man, we are going to be here awhile. Natasha, the only other brave soul to experience getting dressed up, and I were then ushered to the second floor for our first step: picking your yukata. 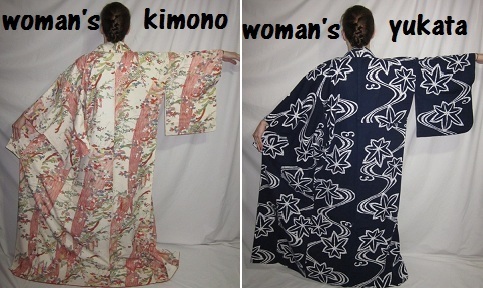 Choosing a yukata is not as easy as it may sound. If you are an indecisive person, I recommend you never go through this experience. With all the elaborate, colorful, and diverse patterns available, it was excruciating having to pick only one robe. Then, after choosing a robe, we had to pick a sash, then shoes, then a purse, and then a rope belt. My head was swimming from all the decisions and options. Natasha was having an equally difficult time, and we relied on each other and the women working there to come to our conclusions. After about 45 minutes of second-guessing, we made our final decisions and were ushered to the fourth floor for our dressing. We reached the fifth floor, the final step, where we were met with one last decision: choose a hair style. We chose quickly, and eagerly awaited the final reveal. When the stylists were finished, I stared in the mirror for what felt like a lifetime. It was me, but it wasn’t me. Being the nerd that I am, I thought, is this how the Japanese felt when they first wore Western-style clothing during the Meiji Restoration? The feeling was indescribable, and anything but negative; I couldn’t wait to show everybody! Like night and day (Natasha had a bright blue yukata, and I had a black one, as pictured above), Natasha and I walked out to gasps and claps from our classmates. Excited to go take pictures, I started putting my shoes on by the door, only to be busted by a sweet older Japanese woman who instructed me to put on the wooden shoes we were provided. I mentally scolded myself, as I am an advocate for living outside of one’s comfort zone, but the thought of walking around in wooden shoes just seemed painful. Of course I smiled, gave the proper sumimasen response, and started to put on the wooden sandals, which the woman bent down and helped me with. With the first wooden flop of the sandals, we were out the door, but the experience was far from over. Natasha and I were like celebrities walking around Gion. Both Japanese locals and foreigners alike complimented us and took our picture. Surprisingly, the sandals turned out to be extremely comfortable, albeit a tad too short in length for my size 8.5 feet, and I look forward to wearing them again someday. The yukata was also light and airy enough for the heat, and it wasn’t as constricting as I had originally expected. After about 20 minutes, I no longer felt the cinched belt around my waist. Picking things up off the ground, however, was no small feat. Thank goodness our classmates were there to graciously hold our bags and help us whenever necessary. At the end of the day, I was sad but ready to take the yukata off. As with all great creations, it took less time to disassemble than it did to assemble it. Luckily, Natasha and I were roommates at the hotel, so we could help one another unravel all the intricate bows and knots to get undressed. We then discussed how the experience, although expensive, was definitely worth it. Just the fact that we now know all the work that goes into wearing a yukata makes us appreciate and respect the talents of those who walk around in them even more. The Japanese people also made us feel welcome during our cultural experience, inviting us foreigners into their traditional form of beauty. Mainly, this experience added to my trip to Japan by facilitating my understanding of, and feelings toward, its culture rather than just its history. I now understand how yukatas and kimonos are actually more like art forms than simply fashion statements, and I think they are art forms that the Japanese people are justifiably proud of. In our EASC 360 class, we sometimes discussed the identity of Japan, and if there is anything that can be considered solely ‘Japanese.’ For me, Japan can be found in every aspect of the yukata: the gorgeous detail on the robe; the structure provided by the sash and belt; the precise form, teamwork, and skill it takes to assemble it; and the effortless-looking final product, with no hair out of place. That, to me, is very much Japanese.